Buy Bona Hard-Suface Floor Cleaner from Owen Carpet. Bona’s Swedish Formula floor care systems are the healthiest, easiest and most effective way to clean your hardwood and hard surface floors. Bona has been providing professions with the world's finest hardwood floor finishes from Sweden since 1919 and now are offering it to you. The Bona Floor Care system consists of a non-toxic waterborne cleaner that is specifically designed for polyurethane-finished hardwood flooring or hard-surface flooring. Bona floor care systems are the right way to care for your hardwood or hard surface floors, while protecting your indoor air quality and the environment. Having a healthy floor starts with knowing how to properly take care of it. To take care of it, we have listed three simple steps to help you keep your floors looking great for the life of your product. Vacuum, dry mop, or sweep to remove any loose dirt or grit. The best method of removing dirt and grit is to vacuum with a soft brush attachment on your vacuum. If you are using the Bona MicroPlus mop to dry mop, remove any loose dirt or grit after dry-mopping. You can do this by rinsing with water and wringing out the mop pad prior to cleaning floor with Bona Flooring Cleaner. This helps to ensure that your floors are prepared and void of dirt that could leave spots or film when you apply the Bona Floor Cleaner. Having a fresh floor to work from is the first step in keeping a clean floor. Next, you will mist your floor with Bona Floor Cleaner to allow it time to seep into your floor and attach to any remaining dirt or grim. Lightly mist a 4' x 6' area of your floor or directly mist the cleaning pad with Bona Hardwood Floor Cleaner or Bona Hard-Surface Floor Cleaner. Clean your floor using a slightly dampened, well wrung-out Bona MicroPlus cleaning pad, thoroughly clean the floor surface using your Bona MicroPlus mop. Making sure to finish one area before moving on to the next. When your mop pad becomes soiled, rinse with water, and thoroughly wring out the pad before you continue cleaning with Bona Flooring Cleaner. When the mop pad becomes excessively soiled, launder and replace with another clean mop pad. Continued use of excessively soiled pads may cause streaking. Hardwood Flooring is a great way to enhance the look of your home and give it the warmth that only comes from hardwood. To keep your hardwood flooring looking as if it was just installed, you need a way to protect it from the premature aging that comes with dirt, grime, stain, and scuff buildup. The Bona Hardwood Floor Cleaning System is specially formulated to help keep your floor looking great for the lifetime of your hardwood floor. $34.99 The Bona Hardwood Floor Cleaning Kit includes everything you need for easy and safe cleaning of your polyurethane-finished hardwood floors. 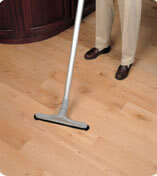 The system includes the Bona MicroPlus Mop with three piece pole, 32 oz. Bona Hardwood Floor Cleaner, Bona MicroPlus Floor Cleaning Cloth, and the Bona Floor Care Guide. When you purchase your Bona Hardwood Floor Cleaning Kit, you will have everything you need to have a fabulous looking hardwood floor and keeping it looking great for years to come. $4.99/4oz. Bona Hardwood Floor Cleaner is specifically formulated to clean all polyurethane finished wood floors and factory pre-finished wood floors. This Swedish Formulated Hardwood Flooring Cleaner quickly wipes out red wine, dried spaghetti sauce, mustard, ketchup, and heel scuffs. 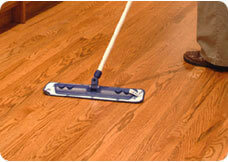 Unlike all-purpose cleaners, the Bona Hardwood Floor Cleaner will not dull your floor finish or leave an oily residue. Bona's Hardwood Flooring Cleaner is a waterborne, non-toxic, environmentally responsible cleaner that will leave your floors looking great. Hard-Surface Floors are a wonderful way to had a custom atmosphere to your home and set it apart in its own space in time. Whether it is a linoleum hardwood look in one room, a setting of vinyl tile in your kitchen, marble in your entrance way, granite slab in your foyer leading to the stone floor in your sunroom, hard-surface flooring adds a perfect accent to your home. Bona has developed a hard-surface cleaning system to help keep your custom floor looking great for the duration of your floor's life with their specially blended formula that keeps stains, dirt, grime, spills, and scuff marks from tarnishing it's look. $34.99 The Bona Hard-Surface Floor Cleaning Kit has all the necessary supplies to easily and safely clean your sealed hard surface flooring including: laminate flooring, vinyl, no-wax linoleum, terrazzo, unglazed tile, stone and sealed porous marble. The system includes the Bona MicroPlus Mop with three piece pole, 32 oz. Bona Hard-Surface Floor Cleaner, Bona MicroPlus Floor Cleaning Cloth, and the Bona Floor Care Guide. When you purchase your Bona Hard-Surface Floor Cleaning Kit, you willhave everything you need to have a fabulous looking floor and have it looking great for years to come. $4.99/4oz. Bona Hard-Surface Floor Cleaner is a swedish formula designed to help your floors look great for their lifetime in your home. Bona's Hard-Surface Cleaner is an easy and safe way to clean sealed hard surface flooring including: laminate flooring, vinyl flooring, no-wax linoleum, terrazzo, unglazed tile, stone and sealed porous marble. The Bona Hard-Surface Floor Cleaner comes in a convenient spray bottle to help you get to those hard-to-reach areas and carry with you in an ergonomical design. Help keep your floors in their original luster andbeauty with Bona's Hard-Surface Floor Cleaner. $11.99 The Bona MicroPlus Floor Cleaning Cloth is ideal for spot cleaning floors. Its super absorbent design and construction is perfect for cleaning hardwood, laminate, tile, linoleum, vinyl, or stone - use wet or dry. The Bona MicroPlus Floor Cleaning Cloth can pick up and trap dust, dirt and allergens using electrostatic action when used dry. Use with Bona Flooring Cleaners to eliminate grease and other tough stains or spills. The Bona MicroPlus microfiber cloth is made with the original Starfiber microfiber to give your floors that professional touch.